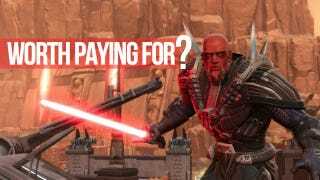 Back in December BioWare's dueling doctors told us they couldn't see their newly-launched massively multiplayer online Star Wars role-playing game going free-to-play in the foreseeable future. Then BioWare botched several free game updates and lost a good chunk of the game's subscribers. Suddenly free-to-play isn't looking so bad. In an interview with Games(TM), lead designer Emmanuel Lusinchi says the popular pay model is being explored. The MMO market is like none other in the games industry. The customers are more demanding. The support is more intensive. The development cycle never ends, and where there are bugs in your code or kinks in your gameplay the reaction is massive and brutal. BioWare in an incredibly accomplished and reliable video game developer, but one does not simply go massively multiplayer. The past seven months have been pretty brutal for Star Wars: The Old Republic, rife with small problems exacerbated by the fact that BioWare is at the helm. If this were a game from a traditional MMO outfit fans would probably have been more accepting of the missteps. Then again, if BioWare were a dedicated MMO studio they might not have made the missteps in the first place. That and the power of the brand and the developer drew in players that had never played an MMO before. They were certainly not prepared for all of this. So here we are, seven months later, exploring the unforeseeable future with lead designer Emmanuel Lusinchi. It's a wise decision. The free-to-play model allows a developer much more room to make mistakes and be forgiven. And, as demonstrated by games like Lord of the Rings Online and Dungeons and Dragons Online, going free-to-play often equals a massive influx of cash, which can then be used to subsidize those updates players are constantly demanding. Hell, I'd pay $20 for a pink lightsaber. I've reached out to BioWare for further comment on these potential plans for free-to-play.